TENNIS: Heartbroken Alex de Minaur went down swinging in a vastly impressive Davis Cup debut, falling in five sets to Germany's world No.5 Alexander Zverev at Brisbane's Pat Rafter Arena. The teen "Demon", mixing raw energy with consistency and tactical composure, had been on the verge of one of the great debut wins in Australian Davis Cup history and should have no regrets about a 7-5 4-6 4-6 6-3 7-6 (7-4) loss to Zverev in the opening match of the tie. A rueful de Minaur, 18, led by a break of serve in the fifth set at 3-0 and had a break point for a 4-0 advantage but made a backhand error. Zverev, who lost a fifth set to love in his Australian Open upset by Hyeon Chung last month, gained some belief from the escape and took the service break back in the next game when the Australian made three groundstroke errors. De Minaur was fighting back tears as he walked off after Zverev made the most of his greater power in the tiebreak. Zverev, who has a poor best-of-five set record and has not made a Grand Slam quarter-final, showed steel in his makeup after being encouraged by world No.2 Roger Federer that his time in a major would come. Queensland's dual Grand Slam winner Rod Laver had presented de Minaur with his gold team jacket last week when he was became the 109th man picked to play for the Australian Davis Cup team. Australian captain Lleyton Hewitt had, in his selection of de Minaur for singles duty, backed de Minaur's mobility and defence to make life difficult for Zverev, who struggled to put the stamp on the contest expected of a top-five player. De Minaur, ranked No.139, served notice of years of upcoming service for his Australian team in front of past champions including Ken Rosewall, Ashley Cooper and Tony Roche. The Spain-based right-hander will not get a chance to play again until the fifth and final rubber on Sunday, when he is scheduled to meet German No.2 Jan-Lennard Struff. Struff followed Zverev on court as the opponent of Nick Kyrgios in today's second Davis Cup singles match. 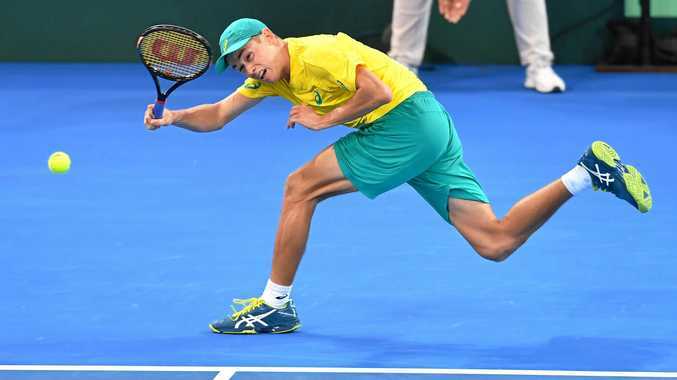 De Minaur more than held his own when able to draw the world No.5 into rallies once past the greater serving and forehand power of his opponent. At 3-all in the fourth set, Zverev complained to the tie referee about a sign showed by a member of Tennis Australia's approved "We The People'' cheer squad seated together on one side of Rafter Arena. Angered, he reeled off seven consecutive points. De Minaur's comfort with the environment on Rafter Arena was apparent, four weeks after his run to a first ATP semi-final in the Brisbane International. "Alex is playing unbelievable tennis and Australia has a very good one in him," Zverev said. "He's going to be up the rankings very soon if he keeps going like that. Zverev has not made a quarter-final at a Grand Slam event, attesting to his limitations in best-of-five set tennis in a career in which he has twice won a title at the second-tier ATP 1000 level. "The main thing Roger told me, I'm going to keep to myself. But he told me to keep working hard. He said the result in Grand Slams will come if I keep doing the right things," he said.